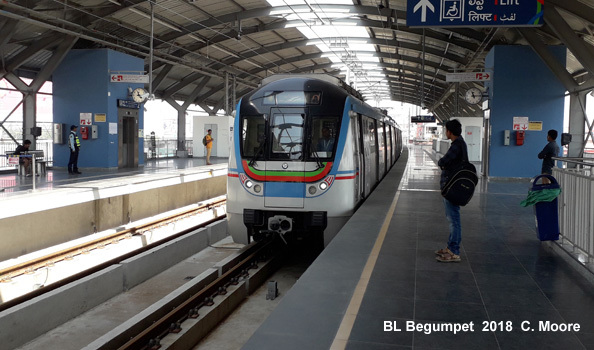 Hyderabad, capital of the Telangana state in India, is building a metro system, after building the newest suburban rail network of India in 2003. The project was approved by the Union Government in 2008. The total length is 66 km, extendable to 71 km. 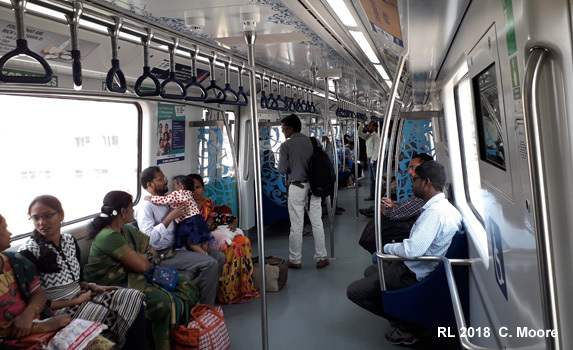 Hyderabad Metro Rail Limited has been created specially for this project. With a population of about 7 million and considerable floating population, the city is struggling with increasing traffic congestion due to fast growing IT, ITES, pharma, and various other manufacturing and business activities. 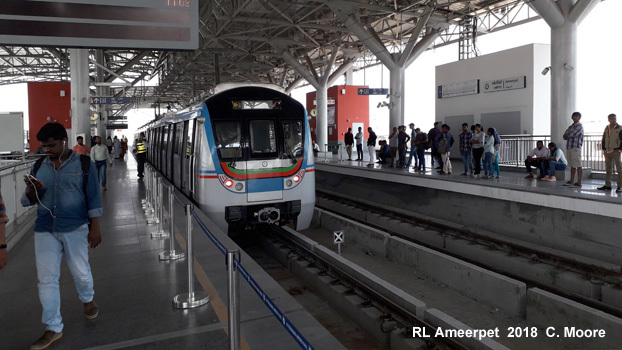 The current local train system known as the Multi Modal Transport System (MMTS) operational since 2003 runs on existing tracks meant for long-distance trains supplemented by ageing Diesel Multiple Units (DMU) locally known as push-pull trains operational since the 1980's. 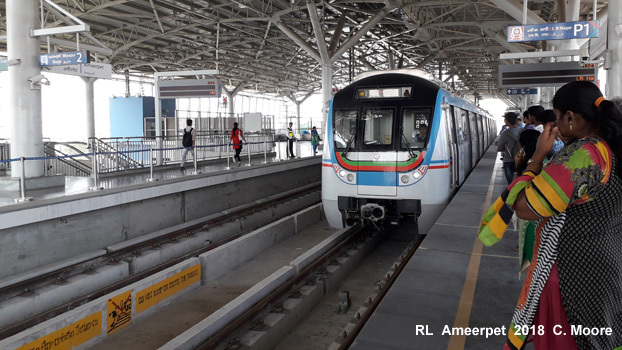 The Hyderabad Metro is currently (Oct 18) the second longest metro in India at 44.9 revenue km. Two lines operate and a third is in construction and these currently serve the northern, western and southern areas of the city. 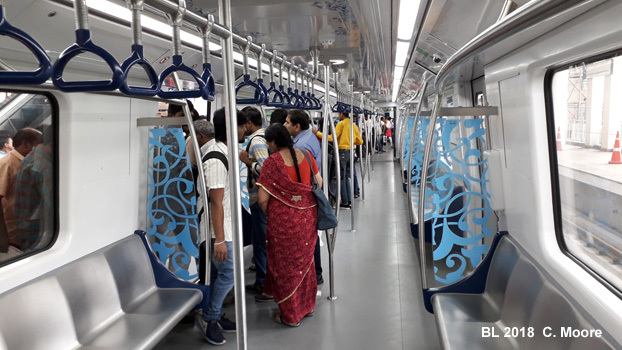 The Metro runs fully on viaduct and its 36 stations are, in the main, of a standard formula for India. Running above major corridors the basic entrances are located on the street and involve a stair climb to the entrance level where security, ticket office (tokens 10-60 rupee), a pleasant schematic map and occasional food shops are located. These are dark, cool and basic spaces with the flanks used for stair/escalator access to the side platforms. At this high level there is a rudimentary strip map, seating and basic RTI for next train only. Platforms are topped by arched, corrugated ceilings with a central open section. At MG Bus Station, the scale of station buildings becomes even more obvious. 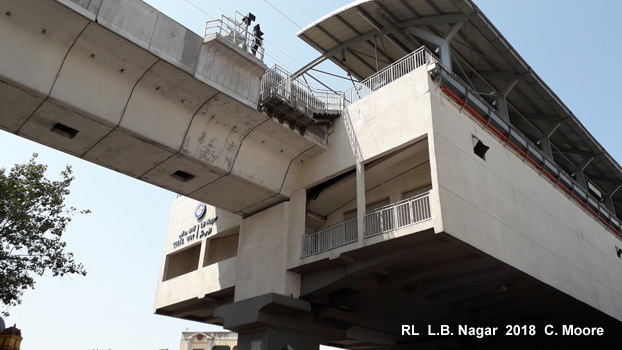 Here the new Line 3 construction is on a level higher than current services – it looks impressive but is such scale necessary? On all stations, the platforms are built for 6 car sets but 3 car sets operate, with lots of cordons on the platforms to stop wayward passengers. The routes wind gently in peripheral areas and speeds are good, but nearing the centre, there is such weaving above the streets that line speeds are very slow. 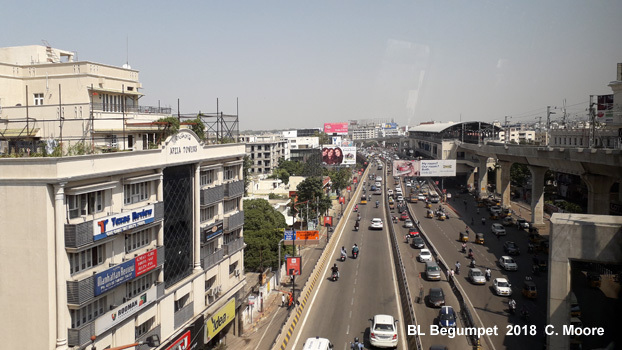 Around the central area, the metro does offer some great views of this interesting city, with its various architectural styles, and at Ameerpet the station is quite different from the other stations. From the south, the blue line crosses the red line from below and runs parallel but at a lower level before entering the station. The blue line platform is to the west of the station with the red line to the east, and one level higher. Transfer is well signed and straight forward, although train arrivals are not dovetailed. 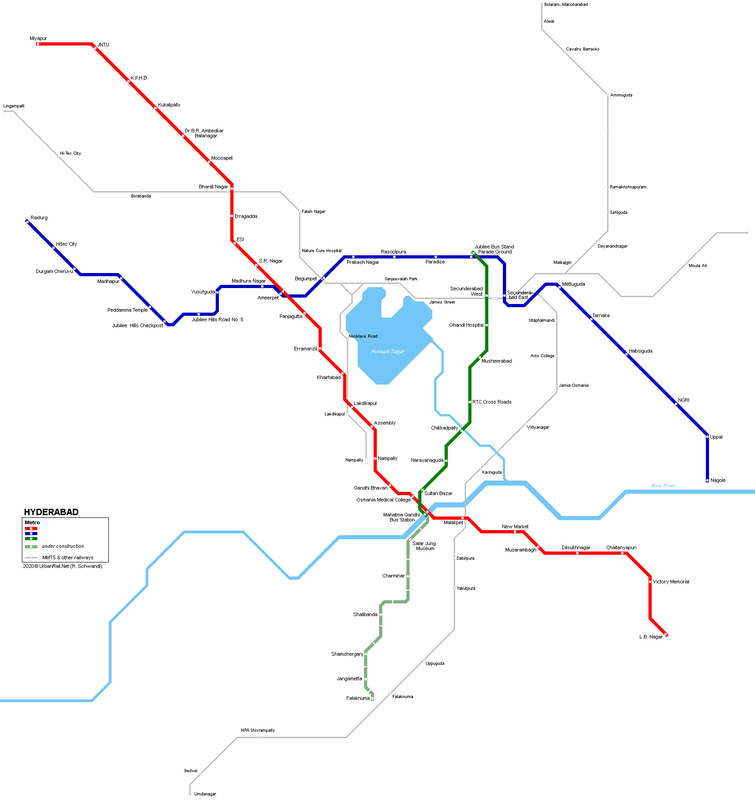 The Metro also connects with the MMTS system and other rail services at seven stations. Trains run at 8min base headways from 0600-2300 and consist of 3 car Rotem stock. The front has blue, red and green stripes along the base of the window unit, whilst the interior has metallic side seating, each set of seats being bounded by glass panels with a blue swirly motif, a motif which is repeated on the ceilings. 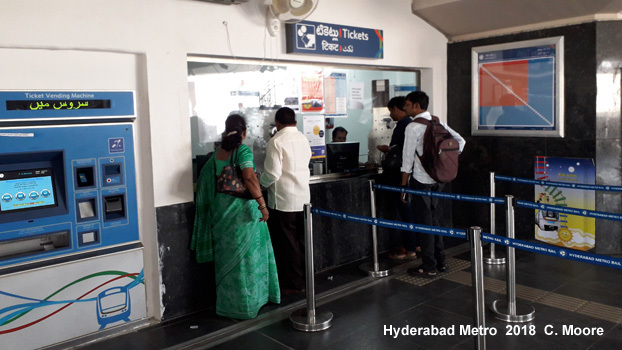 There is electronic information and audio which, along with station signage, is in Telugu, Urdu, English and Hindi. Half of the front carriage is cordoned off (little purple tape) for females. Trains are not overly full despite only having three carriages and headways appear to be adequate to meet demand. The metro will no doubt become more important and busy once other expansions are completed and it would be interesting to see how that changes the current, rather placid, feel to the system.